The leader of Merrill Lynch says the firm's biggest challenge is to remain nimble and relevant. In this new series Research magazine talks with the heads of leading investment and wealth management firms about their careers and the key issues they see facing the industry. 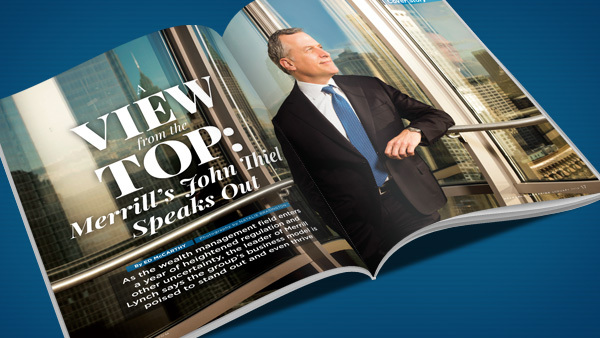 We are pleased to launch the series with John Thiel, head of Merrill Lynch Wealth Management. Thiel, who joined Merrill Lynch in 1989, is responsible for the strategic management of over 14,500 financial advisors and 150 private wealth advisor teams. He spoke with Research at his New York office. How did you get started in wealth management? I was in the insurance business. It was a family-owned general agency, so we not only sold insurance directly but insurance brokers purchased insurance products through us where we got an override. It was a very successful business in Tampa, Florida, but I didn’t have the same last name as the owners; the more productive we became, the less the owner wanted to share. I was approached by what we then called a market executive at Merrill Lynch about the prospects of joining the firm, of which I knew very little. I had been in public accounting and then the insurance business. When I was being courted by Merrill Lynch, what I realized about a wirehouse or a broker-dealer like Merrill Lynch is that when I thought about helping my clients and doing financial planning, in the insurance business, that all resulted in the purchase of one of three things: a life insurance policy, a disability insurance policy and/or an annuity. When I looked at what the solution set was at a place like Merrill Lynch it was so much broader and, to me, provided so many more appropriate funding vehicles for people’s future liabilities or goals, if you will. So, I got very excited about the ability to help people on a much broader and a much more direct and liquid basis. I’m not saying that risk management isn’t very, very important but it ends at some point and then asset and investment management begins once your risk management profile is set up appropriately. That is the reason that I joined Merrill Lynch in June 1989 — I thought there were more ways to help my clients and potential clients at a firm like Merrill Lynch than there were where I was in the insurance business. What is the most significant change you have you seen at Merrill Lynch, and why did it occur? It would have been 2008 when our firm — like several others in the financial services industry — struggled, and we were taken over by Bank of America or merged with Bank of America. It really allowed this business to prevail and now to, in my mind, flourish. What is the biggest challenge facing Merrill Lynch today, and how is the firm addressing it? I think the biggest challenge is for us to remain nimble and relevant given three big factors. One is to stay relevant and nimble and adapt to the regulatory reality in the environment which ultimately will be a harmonized, higher standard of care for our clients over and above the suitability standard. Two, it’s just the nature of the competitive set and the role of technology and the role of some subset of the competitors to potentially disrupt the value or question the value of advice. When I mean advice, I mean more holistic planning advice, not just investment advice. The third is to stay relevant to the evolving needs and wants of our clients, which are going to be based on their behaviors. Those behaviors could be how they access us, how they interact with us, how they collaborate with us, and how much we empower them in the relationship. All those behavior changes are going to manifest themselves in a relationship with a firm like ours and our clients and prospects. When you mention the role of technology and potential disruptors are you thinking of robo-advisors? Automated investment — that’s really what it is. It’s not a robot. It’s an algorithm that is automating some component of the investment process, which we embrace because it creates capacity and allows us more time to spend time talking to our clients about what keeps them up at night. It’s probably not the one basis point difference between their return and the S&P. What are the biggest challenges facing the wealth management industry? They would be absolutely the same [as what I described earlier]. I don’t think that ours are going to be any different. I consider us at the front edge of leading and adapting to those things as we speak, but it absolutely has relevance to every industry participant. What is the future of the wirehouse/full-service employee-advisor model? And could you address the employee-advisor model in light of what’s going on within the RIA space, as well? Well, the regulatory changes and any complexity around that, I think, bodes well for the employee, how do you say it, employee-advisor model. You’re going to have to have a pretty robust staff to understand, anticipate, adapt and then implement a whole series of control functions and aspects that are going to be necessary to demonstrate what some describe as the best interest standard. That is going to be a skill set that is probably not in the wheelhouse of many people who are advisors, and it’s going to come at a cost that perhaps they didn’t anticipate. Let’s just look at what [SEC Chair] Mary Jo White said [recently]. She’s open to the idea of third-party audits of the registered investment advisor industry, she’s not giving it up; she’s willing to consider outsourcing some portion of that so more registered investment advisors can be examined. So, the way I read that is that they want to make sure that everybody is demonstrating that they’re working in their clients’ best interest, and the only way to really know that is to check. People are going to have to think about that and incorporate that into their resourcing and their financial plans. Working with an organization like ours and has a long history of doing that well, that has a great working relationship with our regulators, that can really do this as business as usual and not start up a whole function, I think bodes well — because I don’t see the regulatory attention lessening over the rest of my career. In terms of the challenges facing you and your career, how do you see yourself overcoming these hurdles? I think it’s maintaining the energy and the capacity to really stay mindful in and around those key challenges, if you will, or opportunities. You’ve got a big business to run, you’ve got to anticipate now to some degree the regulatory impact that’s coming; you’ve got to respond to all different types of competitive threats, such as when you think about payments, when you think about automated investment. Of course, I want to stay very centered and focused on what it is our clients need from us and want from us. You’ve got a company that’s big and has been around for a long time, so managing and doing all that and leading across those spectrums tends to impact one’s energy. So, it’s maintaining the energy to live up to my own standard for myself. What else would you like to share about the industry and your role in it? What we do for our clients is so important, because at the end of the day what our clients come to us for is ultimately peace of mind. When we can really, truly understand what it is our clients are trying to accomplish, then we can really show them where life meets money and are able to highlight for them that their resources can and will fund whatever it is their needs, priorities, concerns are. That puts that client at ease. Then we do that on a regular basis, so they can constantly be reminded and reinforced that they’re on the right path — because that’s what people want. They want to know that they’ve done what they need to do to accomplish what it is they want. We provide that peace of mind, and I think all too often that gets overlooked, not by our clients, but by people who talk about what we do. My role in that is to highlight and preserve that and enhance our ability to do that in a transparent way that’s really never been demonstrated before in the industry. For the third quarter of 2015, the global-wealth business had total revenues of $4.5 billion, of which $3.7 billion came from Merrill Lynch operations; for the 12 months ending Dec. 30, 2014, the group’s total sales were $18.4 billion, with Merrill Lynch’s revenue coming in at $15.3 billion. Net income for GWIM was $656 million for the third quarter of 2015 and $3.0 billion for the full year 2014. Client assets total $2.4 trillion as of Sept. 30, 2015; some $1.9 trillion are in Merrill Lynch accounts; these figures are down slightly from $2.5 trillion and $2.0 trillion, respectively, as of Dec. 31, 2014. As for the number of advisors, including those in consumer banking, there are about 16,605 as of Sept. 30, 2015; without the consumer banking advisors, the Merrill Lynch headcount is 14,563. This is up from 14,085 in December 2014. Financial-advisor productivity, which measures advisors’ total yearly fees and commissions, is about $1 million as of Sept. 30, 2015. It stood at $1.1 million on Dec. 31, 2014.